Add some Middle Eastern warmth and sensuality to your home with Anya’s exquisite Turkish glassware, which adds a welcoming touch to any space. These collections of intricate designs are perfect for serving food or just resting on a shelf to be admired. And just like true works of art, they have subtle differences. No two Anya products are quite the same. 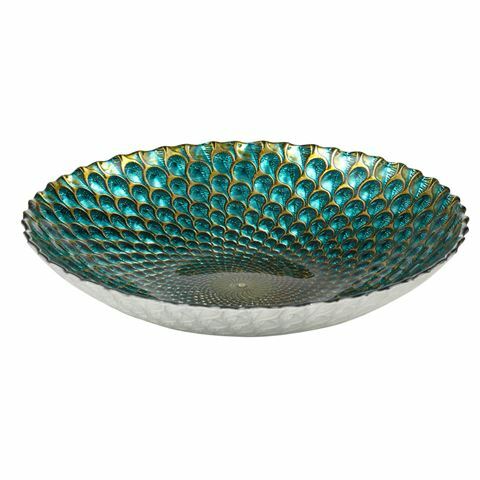 This beautiful Plume bowl, inspired by a peacock’s feathers, would make a great fruit bowl or use it to serve Middle Eastern inspired snacks. Dimensions: 32cm (l) x 6.4cm (h)..